Genius is all around us, yet it can still be a challenging concept to define. Thankfully, author Deborah Kespert seems to have found a delightful way to tell the story of genius. Her latest hardcover picture book, Genius! 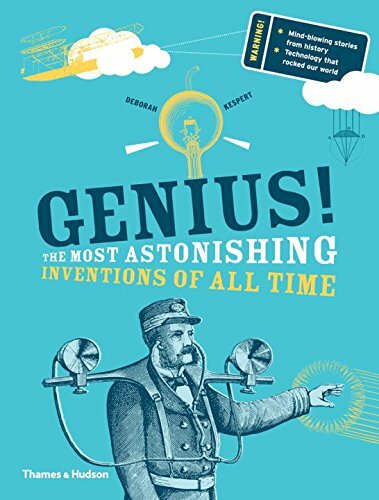 : The Most Astonishing Inventions of All Time, offers a step-by-step account of genius and perseverance. Although written for ages 9 to 11 (grades 4 to 6), history and innovation lovers of all ages are sure to enjoy its 96 pages of arguably the most inspiring inventions out there. There are tales that range from who invented the computer and the telescope to who created the Internet, and each one is more exciting than the last. Readers get a refresher course on well-known inventions like the telephone, the printing press, and the light bulb. But they are also introduced to lesser-known facts behind amazing inventions like wireless communications (invented in 1901), the Internet (invented in 1991), and the Saturn V and V-2 rockets (invented between 1958 and 1969). There is delicious back matter outlining curious facts like teen inventions (e.g., 16-year-old George Nissan invented the trampoline in 1930); “mistake” inventions (e.g., the Kellogg brothers invented cornflakes in 1894 after some wheat they were baking went stale); and inventions by women (the circular saw was invented by Tabitha Babbit in 1813!). There are fascinating sketches and prototype drawings, and there is even a picture of a dare-devil Berta Benz perched proudly on the first three-wheeled motor vehicle designed by her husband, Karl Benz. If you didn’t know, the Benzes went on to found the Mercedes Benz manufacturing brand. Be careful! This book may well conjure every urge you’ve ever had to invent something wild and wonderful for the world to see.